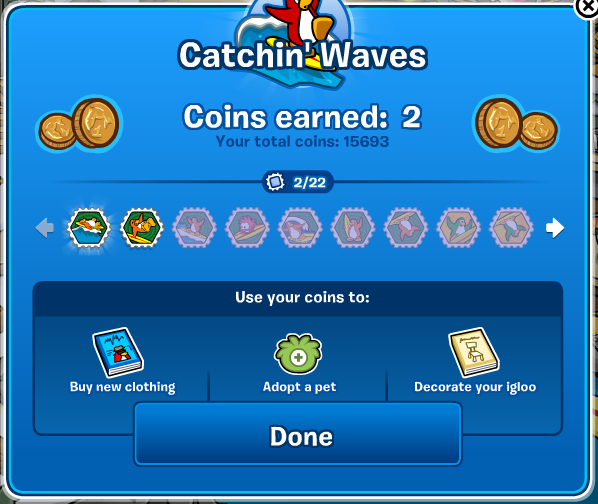 Catchin' Waves is a game where you can enter surf competitions or just surf for fun and practice your tricks. It has been the favorite game of many Club Penguin players. On this page you'll find my guide on how to play as well as some cheats for the game. First Step: Click on your map and click the icon called "Cove". 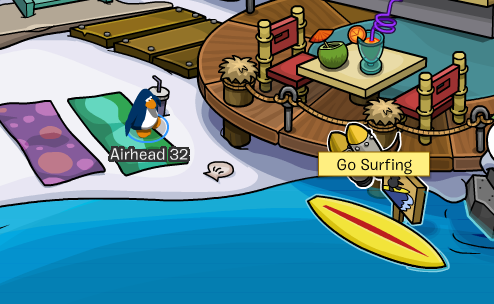 Second Step: Click on the yellow surfboard in the water. Third Step: Select your game mode. You have four options - Surf Lesson, Freestyle, Competition and Survival. 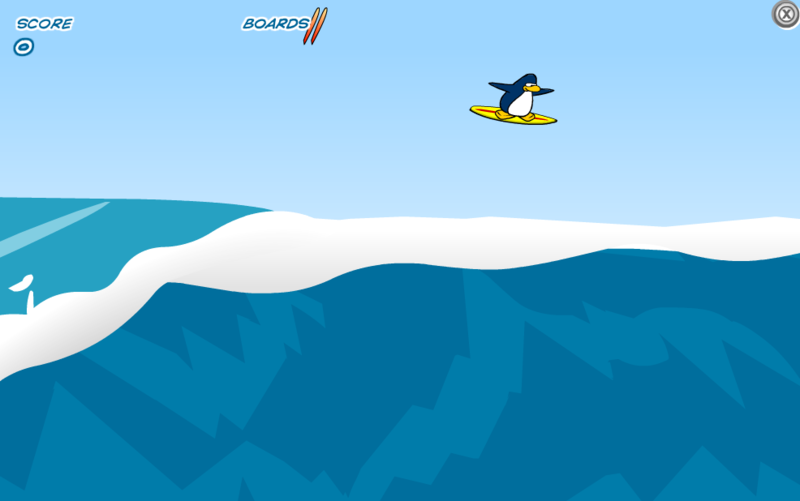 - Surf up and down by moving your mouse up and down on screen. - Lean forward or backward by moving your mouse right or left. - To gain speed, lean forward and move your mouse downward to steer down. - If you feel like you're losing your balance then lean back, left click on your mouse and hold it. - Move your mouse above the water to do a normal jump. 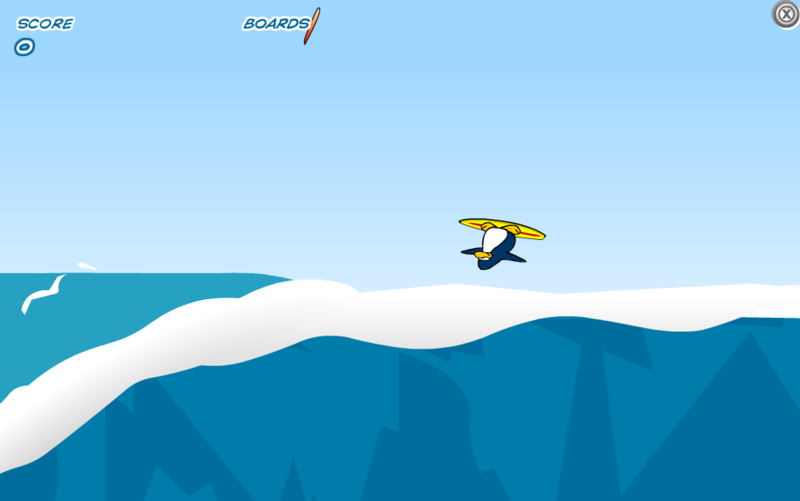 - While your penguin is in the air, move your mouse in a circle and your penguin will do a flip. 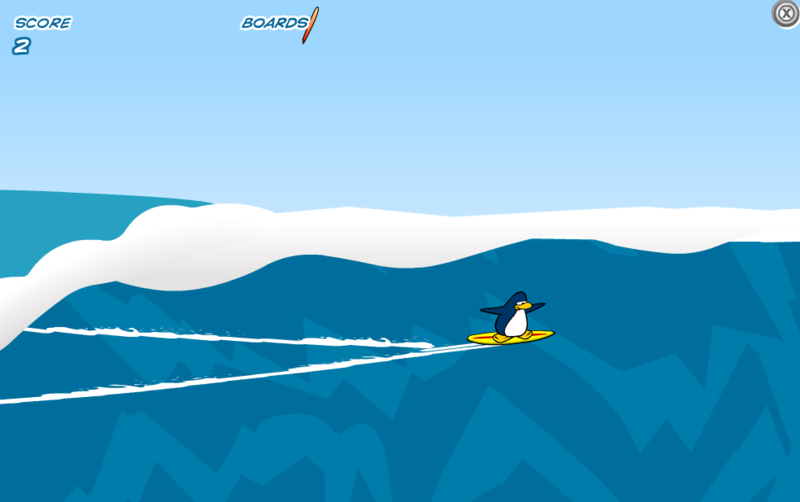 - Moving your mouse in a circle more quickly will cause your penguin to perform more than one flip. - You can perform tricks by using the arrow keys on your keyboard or the W, A, S, D keys. - The more tricks you perform, the more coins you will get at the end of the game. - Press the keys in different order to perform much cooler tricks. At the end of the game you will receive the coins that you earned. You can also earn special stamps in this game. Each stamp has a different way of being unlocked. 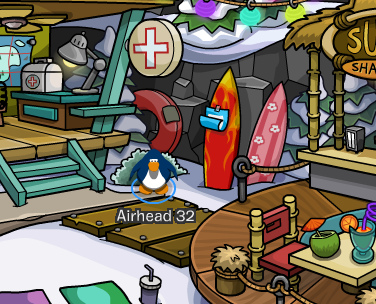 Did you know that you can buy a surfboard to use while you're playing Catchin' Waves? There are three surfboards to choose from. First Step: Go to the "Cove". 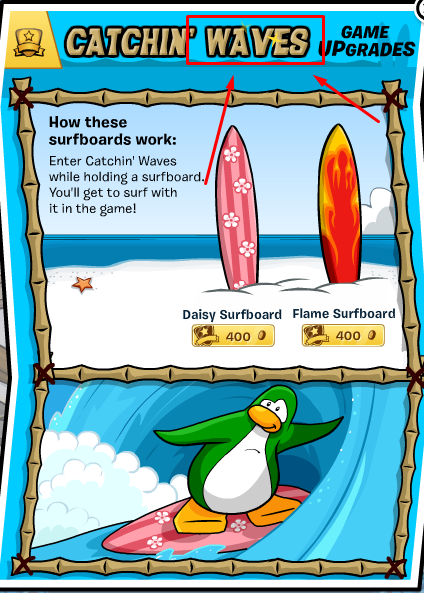 Second Step: Click on the blue paper that is stuck on the red surfboard. Third Step: Choose a surfboard to buy. 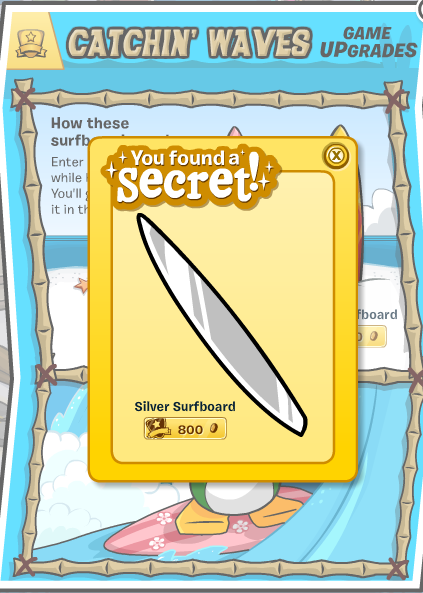 You can reveal a secret silver surfboard by clicking the word "Waves". Those are the basics to this game. I hope you enjoyed this guide and I wish you luck on being a Catchin' Waves professional surfer!